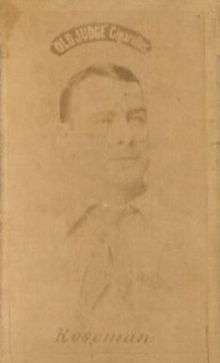 James John "Chief" Roseman (July 4, 1856 – July 4, 1938) was an American Major League Baseball player from Brooklyn, New York who played in the outfield for six teams, mainly in American Association, during his seven-season career. In 1890 he was the player-manager over a short period for the St. Louis Browns. Roseman died in 1938 in Brooklyn, New York, and is interred at St. John Cemetery in Middle Village, New York. ↑ Super 70's baseball player page Archived September 28, 2007, at the Wayback Machine.